From French Bulldog Puppies for Sale, French Bulldog Breeders, French Bulldog Breeders, Mini French Bulldogs, Care, Health, Training, & More! FRENCH BULLDOG: THE FRENCH BULLDOG BIBLE is everything you need to know about French Bulldogs. Everything is covered from French Bulldog breed history, finding the best French Bulldog Breeders, French Bulldog Puppies and how to pick the best, Teacup and Mini French Bulldogs, French Bulldog Care, Blue French Bulldogs, Black French Bulldogs, French Bulldog Training, French Bulldog Adulthood. 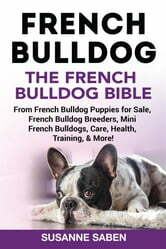 -Canine author Susanne Saben has produced the most in-depth & up-to-date book yet on the French Bulldog yet. The 130 pages are easy to read & packed full of practical info & French Bulldog breeders' tips on everything you need to know about getting to know, caring for & living with the incredibly cute French Bulldog! -PS: This is not a run-of-the-mill book... it is for true French Bulldog lovers- full of real world advice on how to make the most of your French Bulldog's life and journey together!- "